Home / News / Watch out, he's back! 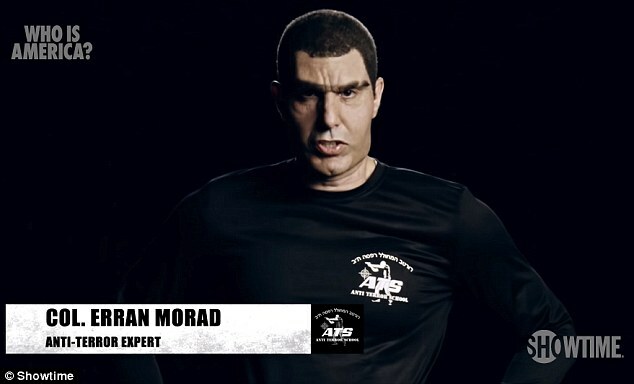 Sacha Baron Cohen dupes politicians and gun lobbyists into endorsing program to 'arm toddlers and schoolchildren with deadly weapons' for controversial new show Who is America? Watch out, he's back! Sacha Baron Cohen dupes politicians and gun lobbyists into endorsing program to 'arm toddlers and schoolchildren with deadly weapons' for controversial new show Who is America? Sarah Palin, Alabama politician Roy Moore and former congressman Joe Walsh are among those who have lashed out at Cohen in advance, essentially turning themselves into ambassadors for Showtime’s marketing department. Other high-profile figures will be featured over the course of the series, although the premiere opens with Bernie Sanders, indicating that Cohen’s targets won’t all be of one ideological stripe, even if conservatives receive the lion’s share of abuse. “I was forced to see a doctor, and suddenly I have three diseases,” Cohen’s Southern conservative character tells a fidgety Sanders, seeking to illustrate the evils of Obamacare. As with his earlier work in this vein, including “Borat” and “Da Ali G Show,” Cohen’s shtick is a kind of performance art, built around just how far he can push his subjects, whose instincts to walk away or yell “cut” are curbed by the fact that they’re being interviewed on camera. He is, basically, boiling a frog — becoming gradually more outlandish, waiting to see how long it takes before they exhibit some inkling that the situation is abnormal. Perhaps for that reason, most of the edited segments run four or five minutes, with each half-hour picking on a range of guests and topics, from a Trump delegate in South Carolina to a Southern California art gallery owner who thinks she’s meeting an aspiring artist who has spent 20-plus years in prison, having taught himself to paint using bodily secretions. The piece de resistance, though, comes during the closing third, as Cohen masquerades as an Israeli gun enthusiast, convincing gun-rights advocates and Republican politicians to endorse his proposal to train toddlers in the use of firearms. Walsh turns up during that sequence, which also includes former Mississippi senator Trent Lott and GOP congressmen Matt Gaetz, Dana Rohrabacher and Joe Wilson. Those interviews are riotously funny, if only because everyone seems so earnest — or at the very least, polite — about someone asking them to read copy that proposes arming four year olds, backed up by claims peppered with scientific gibberish. While the complaints have focused on the deceptive practices Cohen and his collaborators employed, the elected officials engender far less sympathy than the ordinary folks who have been duped, lacking the media savvy or support system to help sniff out this fraudster. Cohen’s ability to adlib in character has always been his greatest gift, even if it’s tempting to wince at times at his excesses, which can tend to place a higher priority on discomfort than comedy. Simply by virtue of the noise generated it’s hard not to say the show already qualifies as a success by its star and Showtime’s standards, although given that “Borat” triggered several unsuccessful lawsuits, in terms of potential grief, the network’s legal department might beg to differ. As for whether “Who is America?” finds an answer to its title, as with Cohen’s past efforts, the series generally provides exaggerated snapshots of America, connected by one overarching picture: the hypnotic, numbing effect that the promise of TV exposure can induce, even on those who should theoretically know better.